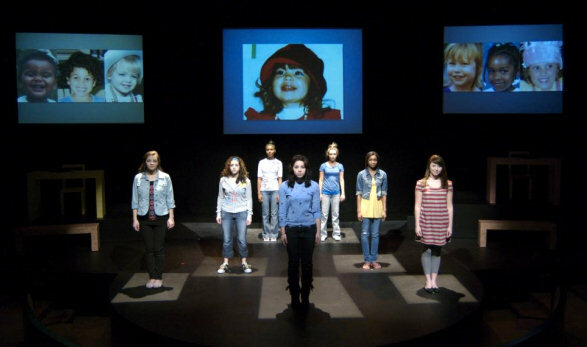 The Secret Life of Girls has garnered well-deserved attention, and Children’s Theatre of Charlotte presents a thoughtful, stage-worthy production of the play. The story revolves around a group of middle school girls. It begins innocently enough when Abby (Chloé Aktas) invites the girls to her birthday party. They giggle, compliment the gifts, and eat pizza. One girl, Kayla (Kali Hackett), spends the night. This irritates Stephanie (Kristyn Callaway), leader of the group, especially when she finds out that Abby wants to join the volleyball team. They won the championship last season, and she thinks Abby will cause the team to lose if she’s allowed to join. At least, that’s what she says is the reason as she begins to ostracize Abby (with the others falling into place). Abby is at a loss as to what she could have done to anger her friends. The insidious nature of gossip and bullying is shown clearly as each of the other girls, including Anna Marie (Lauren Berg), Rebecca (Adriana Jerez), and Sutton (Sarah Slusarick), take their turn being the object of scorn led by the vindictive Stephanie. The adults, Sutton’s Mom/Coach (Donna Scott), and Abby’s Mom (Rebecca Koon) are either clueless or are at a loss as how to help. The structure of the play, by necessity, is episodic as it needs to show the passage of time. The set is spare and the mostly bare stage is used effectively. There are three video screens where projections appear frequently. The technical expertise of the video design by Jay Thomas is solid. And although the videos provide visual interest and some much needed comic relief, it is over-used at times. For instance, when the characters are emailing to others, the actors read the emails, but the projected emails lag behind. We all know what emails look like. Anything in a play that slows the forward progress of the action, or distances the audience, is questionable. Video is a great tool onstage, but its use needs to be judicious. Having said that, Nicia Carla is talented director who clearly has a good rapport with her actors. The adult actors do well, but this is the ensemble of young actors’ play, and the director gets credit for creating an atmosphere where they feel safe to make choices that work even when their characters are unlikable. Each character is distinct and not difficult to differentiate. They are all very good in their roles, but Chloé Aktas as Abby and Kristyn Callaway as Stephanie anchor the play and help give their characters subtext and depth. comments were alternately funny, insightful, and poignant. Adults know that gossip and bullying are facts of life, but for girls, especially the idealistic ones, reality can be a let down. Many don’t have the inner resources yet to know how to deal with an ugly side of human nature, believing it’s their fault. Being a mother to children of both genders, though, I know girls have a more complex road to navigate. The worrisome thing about gossip, rumors and lies is that there is no way to counteract it. The important thing, though, and why this play is a good beginning for discussion, is that we all have choices about who we want to be in the world. I’ve never heard of anyone saying on their deathbed they wished they had gossiped more. If there’s regret, it’s that they weren’t kinder. Our girls don’t just need to know how to get through today. We need to help them see other perspectives on finding their way to a healthy, self-respecting adulthood. Performed March 27 - April 5, 2009. Sound Designer: Van Coble, Jr.